If you are new to One Girl Symphony, I must tell you that their music is very hard to categorize. As a matter of fact, I think we are on the cusp of a new genre. However before experiencing the magical musical world of One Girl Symphony we need to know that OGS is actually a boy and a girl – the talented composer and instrumentalist, Whitney Vandell, a young musical prodigy adopted at the age of two by an American missionary and music teacher, and the exquisite and experienced violinist, William Stewart. Whitney met William online through the random connection of a family-friend. Consider that William had long retired from playing the violin at the age of 21 to start a family, nearly thirty years ago, after leaving the Stuttgart Chamber Orchestra. 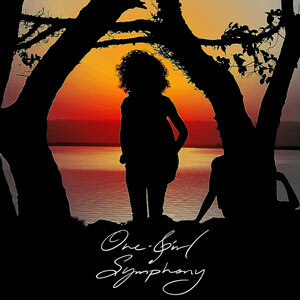 Now, together, One Girl Symphony adventure into classical, rock, hip-hop, folk and blues territories. ‘Today, neither borders nor differences in language or culture can keep musicians apart to stop them from realizing their dreams! Despite us all being from different worlds and working with oceans between us we came together as if we were all sitting in the same room’, says William Stewart, the violinist collaborating on the self-titled, One Girl Symphony album. The inspiring story is proof to musicians worldwide that it doesn’t matter whom you are or where you are located, all that is needed to realize your vision and record an album is a laptop and an Internet connection. 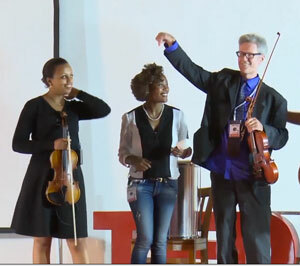 The release of the CD and accompanying DVD film coincided with the premiere performance that united Whitney and William at the TEDx event in Addis Ababa. A crowdfunding campaign was launched and covered William’s flight from France to bring the musicians together on stage to perform. ‘We had never met each other in person but through TEDx we got the chance to realize our fantasy of playing together in front of a live audience’, says Whitney Vandell. 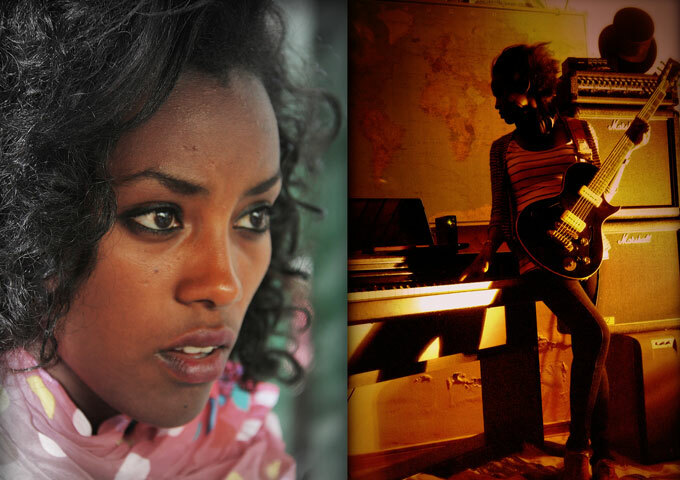 One Girl Symphony’s music takes you to an entirely different time and place like no other current recording artist. I would encourage everyone to listen to each of their songs in their entirety several times before passing judgment as this style of music is unique and often times the really good stuff really kicks in after the 30 second mark. So watch out for those iTunes samples. To be sure, the One Girl Symphony experience is a visual as well as aural one, but that isn’t to say the music itself is dependent on the visual. In fact, on its own merits I found this to be an excellent album, showcasing both Whitney Vandell and William Stewart’s technical abilities along with interesting arrangements and, I should say, a sound that I don’t think you can find anywhere else. It’s just that Whitney is a very beautiful lady, which may distract your attention from the music ever so slightly! Whitney Vandell has certainly set high standards for her music and that is a good thing because it comes through in everything she creates and plays. This young lady is a multi-talented explosion waiting to happen. And that much is clear from the very first track on the album, “No Glitch” right through to the closer. My only caveat when listening to new music is that I need to feel something when I hear a song, not just want to tap my foot. Her music is so emotional, over and above the melodic manipulation of my brain that it feels almost therapeutic. 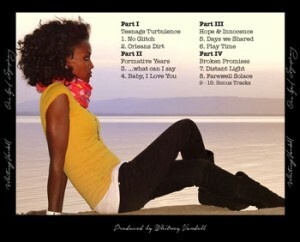 Whitney is finding her own expression in this album. It blends genres of music in ways that are very entertaining. You can hear that she is having fun with the music and is not just going through the motions. Very emotional, mature and soul baring, there isn’t a single song on the whole album I wouldn’t listen to again and again; especially “Orleans Dirt”, “What Can I Say”, “Farewell Solace”, “Eternal Savannah” and “Blues City Jam”. If you like anything that is remotely musical you will most likely enjoy the music of One Girl Symphony. Without words Whitney Vandell and William Stewart can create beautiful images, stories, and emotions. The Sandman’s Orchestra: “The Ninth Wave” – A Reworking of The Kate Bush Album!